My uncle Robert Holland was a crew member on HMS Amethyst, but he demobbed in Australia before she was caught up in the Yangtze incident. I am trying to find out any details about his time on board, or any photos if anyone can help. I am afraid I cannot help you with Information about your Uncle. The AMETHYST Association Members who served in AMETHYST during 1946-48 are no longer with us. The Captain in those days was Lt. Cdr. Scott-Elliot, his obituary via google might give you a glimpse of AMETHYST's movements. AMETHYST's decklogs at the National Archives would give you AMETHYST's movements, but no details of the Ship's company nor life onboard the ship. I am pleased to attach the latest edition of The HMS Amethyst Association Newsletter with details about the 2018 reunion and membership. Trudy is sending information by letter to members on her list. Looking forward to seeing you in 2018! I am writing to you as an ex-serviceman of the RAF, I was 8 yrs old when this incident occurred, but have a good memory. I listened daily to the goings on of the incident on the what was deemed the wireless, also Newspapers. 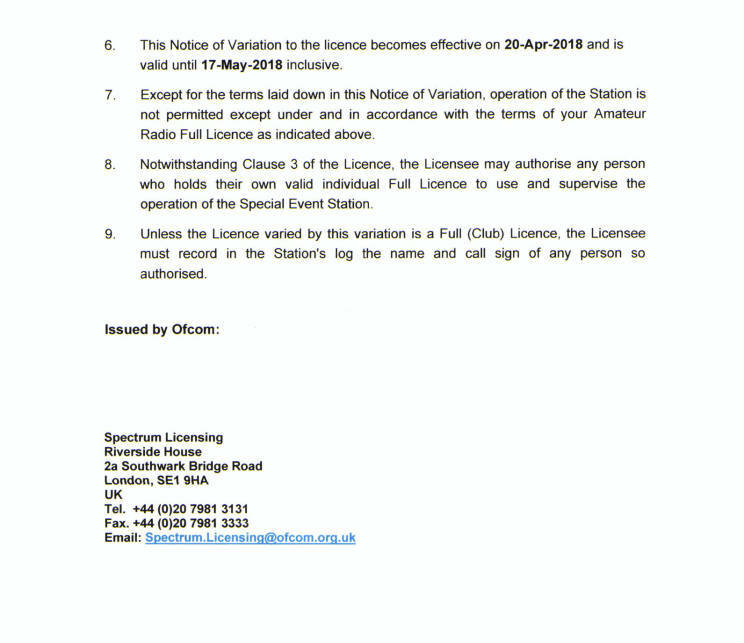 I am 76 yrs old and if I can explain I am a radio amateur licensed through Ofcom. If there is a special event in the world one can apply for a special call sign to remember that event, for example the loss of the SS Flying Enterprise of Falmouth of which I was issued with a special call sign GB4FE to transmit in remembrance of the event. When one gets a response to me transmitting in Morse code the the call sign allocated for the event the operator through the Radio Society of Great Britain receives a what is called a qsl card featured in this email. From the information I have explained, I have obtained a special call sign from Ofcom and will be transmitting this across the world to remember the HMS Amethyst. The call is GB4AMT. I will be transmitting in CW Morse code the call sign and all that answer are logged and the appropriate card sent. This event will be in April 20th until the 17th May. 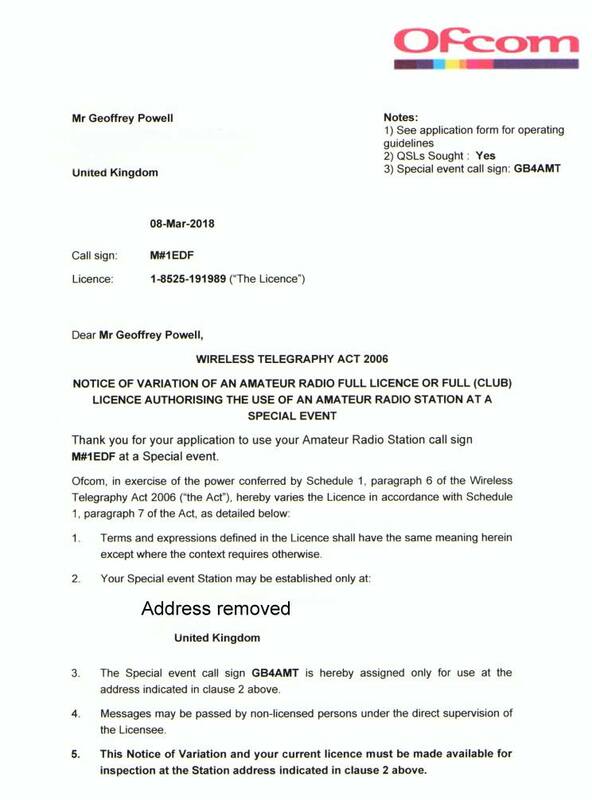 If any amateur radio operator is a member of the HMS Amethyst association they will know about the procedure. For you please put in search box QRZ.COM and look on call signs Click on that and enter in top left box the call sign for the event GB4AMT, you will see a dedication to the men who lost there lives. Please let me know of any difficulty Michael. Own call sign is M1EDF, please look at that too as it is all Maritime features. I wonder if you can help me. My grandfather, Royston Noel Foskew recently passed away, and my family and I are rather stumped by the lack of information left to us regarding his Merchant Navy days. 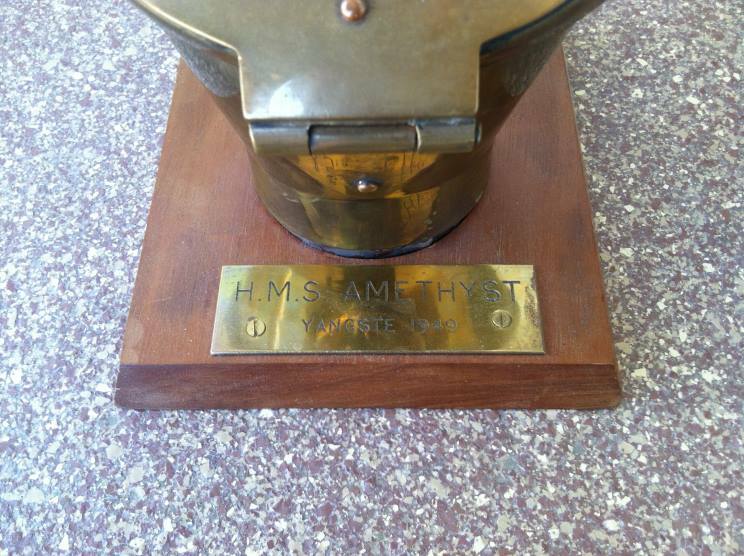 Since he did not like to talk about it, we have very little information, apart from the name of the HMS Amethyst, and we believe he may have been involved in a rescue from the Eddystone Lighthouse. We do not have exact dates either to make things harder. If you have him on any of your records at all, please do let me know as we would love to find out. I am lucky enough to be the current custodian of the NGS with Yangtze 1949 clasp that was issued to Ordinary Seaman Brian E. Wakeham who was on board HMS Amethyst during the Yangtze incident. Can anybody tell me anything about him please? What was his job on board ship? Are there any photographs of him available? Was he evacuated at Rose Island or Hsiao Ho the following day? Are there any books or articles that detail the journey to Shanghai/home for those that left the ship at Rose Island or Hsiao Ho? Any information would be gratefully received thank you. I can confirm that Brian Wakeham was one of the Ship's Company of HMS AMETHYST in 1949 and was onboard when the ship came under fire from the Chinese Communists on 20 April 1949. He was one of the men that we evacuated from the ship, to save lives, on the morning of 20 April.He would have found his way overland to Chinkiang, where he was met by Lt Cdr Kerans and put on a train to Shanghai. Thereafter he would have joined one of the RN ships, still in Shanghai, and taken to HONG Kong. After AMETHYST escaped in August he rejoined the ship. He joined the AMETHYST Association in the 1980s and was then living in Torquay. He dropped out of the Association so I do not know what happened to him. I was doing a bit of research, my father Graham Drew, served on board HMS Amethyst. I remember him talking about it. Unfortunately he passed away in 2002. He wasn't on board at the time of the Yangtze incident, he was transferred before then, but I can't remember when. If anyone remembers him I would really appreciate hearing about it. I joined HMS AMETHYST in June 1948, it is possible that I was onboard at the same time as your Father, but I am afraid I have no memory of him. I do not have any Nominal lists of those onboard, before 1949, so I cannot look him up. I will certainly see if any of our shipmates can remember when we next have a Reunion, but I doubt if I will find anyone who remembers him. Your Father would have had a copy of his Service Record, when he left the Navy, this would give the dates he was in AMETHYST if this Record is still around. I am trying to find a way to track down the HMS Amethyst reunion party to find out if anyone can recall any memories of my grandfather. “Russell William Smith”. I found an audio interview in 1990 that he did about the incident, here is a link to the page. I am also looking for help to find out what medals were awarded as I would like to make sure my grandfather was honoured with the same privilege. From the interview he was one of the men repairing all of the holes from the shells and at one point was floated out on a little boat during fire to check the holes at the water line. I was wondering if anyone could recall this. I served with Bill Smith in HMS AMETHYST, and used to meet him regularly once a year at our Annual Reunions until his death. He was a shipwright and was employed in all the work necessary to repair the damage to the ship and to make her seaworthy. He may have been taken round the ship by sampan to assess the damage to the hull, but I am certain this would not have taken place until a week or more after we came under fire. It is just possible he might have gone over the side whilst the ship was being fired at, but I have no recollection of this happening. All those serving in the ship were awarded the Yangtze bar to the Naval General Service (NGSM) medal. As he was likely to have been awarded the NGSM for service in Malaya when AMETHYST was employed in coastal patrols, so the Yangtze Bar would be the second bar on this medal. I do not know what other medal he had been awarded, but he would be likely to have several WWII medals. The Imperial War Museum made audio recordings of several members of AMETHYST Ships company involved in the Incident. We all received copies of our recordings. I took some photos whilst we were trapped in the Yangtze. Bill would certainly have had copies from me. I do not know what happened to them after Bill died. I expect you know Sheila died a year or so before Bill. Bill's wife Sheila organised the first reunion of AMETHYST men in 1977. 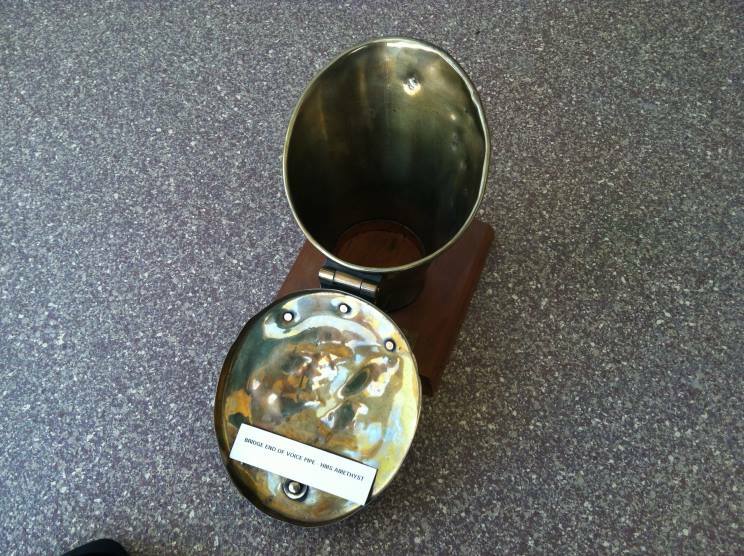 This was a Silver Wedding present for Bill. The AMETHYST Association was formed, following from this meeting, with Bill as the Chairman and Sheila the Secretary. We have held Annual Reunions ever since and our last Reunion was in September 2017. I remember Bill had a son in the RAF and at least one Daughter, you must be the son of one of Bill's Daughters. It is with great sadness that we announce the death of Leighton T. Rees. Leighton died on 22 Oct 2017. He served on board HMS Amethyst as an Ordnance Artificer, during the Yangtze Incident, and was onboard whilst the ship was trapped in the River, and when She made her daring escape down the Yangtze under cover of darkness. Leighton's funeral takes place at 1500 on Tuesday 7 Nov at the Thornhill Crematorium, Thornhill Rd, Cardiff, CF14 9UA. It is with great sadness that we announce the death of Ron Hopkins. Ron died on 27 Sept. in the Macclesfield Hospital. Ron was a Korean War veteran and member of the AMETHYST Association and was a regular marcher with the Four Ships at the Cenotaph on Remembrance Sunday. He even travelled to U.K. from Portugal so that he could join the Parade. His funeral takes place at St. John's Church Buglawton, Congleton, CW12 2ES at 1245 on 17 October, followed by committal at Macclesfield Crematorium. Donations if desired to Lung Cancer Research. All enquiries and donations to Alan Finneron, Funeral Director 32 West St, Congleton, CW12 1JR"
I am the nephew of Edmund Tattersall, ships writer (probationary) who perished on the Amethyst and I've just come into a couple of photos (showing on page 1) of the final service for my uncle and others. I've no idea where the service was held or who else was interred alongside my uncle, but I hope the photograph may be of interest to others on the site, Regards and thank you for the site. I was serving in HMS AMETHYST during the Yangtze Incident in 1949, with your Uncle. All the men killed in AMETHYST on 20 April 1949 were buried at sea in the River Yangtze. This of course included your Uncle Edmund Tattersall. We gave Edmund a full Christian Naval Burial, though we were cut off from the land so we were unable to obtain items such as wreaths. The pictures you have forwarded are of the Naval Burial in Shanghai of the all the other casualties from the Incident except for a few who were buried at sea. There was one AMETHYST casualty buried at this time in Shanghai, Able Seaman Winter. He had been wounded and landed with all the AMETHYST's wounded. Sadly he did not survive the journey and had died when the wounded arrived in Shanghai. The Captain of AMETHYST, Lt. Cdr. Skinner was also landed with wounds which he did not survive, his wife was living in Hong Kong and she decided that her husband should be buried at sea. The Cemetery in Shanghai was destroyed during the Chinese Cultural Revolution. We have established that the graves lie unmarked in Pan Yu Park. At every AMETHYST Reunion we always Remember our Comrades when we read the List of Honour of our 1949 casualties, including your Uncle. You would be very welcome to join us, our next Reunion is in Torquay, 22 to 24 September. It is with Sadness that we announce that Miriam Magor died on 12 July 2017. Miriam was the sister of Patrick Sinnott, one of our shipmates who lost their lives on the River Yangtze in April 1949. She was married to Group Captain Doug Magor RAF. As a Member of the AMETHYST Association she attended some of the Reunions and some of the Four Ship Ceremonies with her Husband. Her Requiem Mass is being celebrated in The Most Holy Name of Jesus Church, 10 Stoke Hill, Oundle, PE8 4BH at 1030 on Thursday 27 July. My uncle Robert Holland was on the HMS Amethyst during the war and demobbed in 1947, in Australia before she went off and got caught up in the Yangtze incident. Do you have any record of him on the crew list and what was his rank. It is with great sadness that we report the death of our Shipmate Bryan Loving on 26 February 2017. Bryan was a strong supporter of the AMETHYST Association and a great traveller in his Campervan with his wife Pam. His Funeral is at 1130 on Tuesday 14 March at the Weymouth Crematorium, Quibo Lane, Weymouth, DT4 0RR. I'm sitting in my lounge in France in front of a nice log fire, (the outside temperature is -2C), watching a repeat of the film with Richard Todd as Cdr. Kerans. The reason for the email is it reminded me that as a very small boy I saw and indeed went on board Amethyst when she was in Millay Docks at Plymouth. Sadly, I also saw her scrapped. 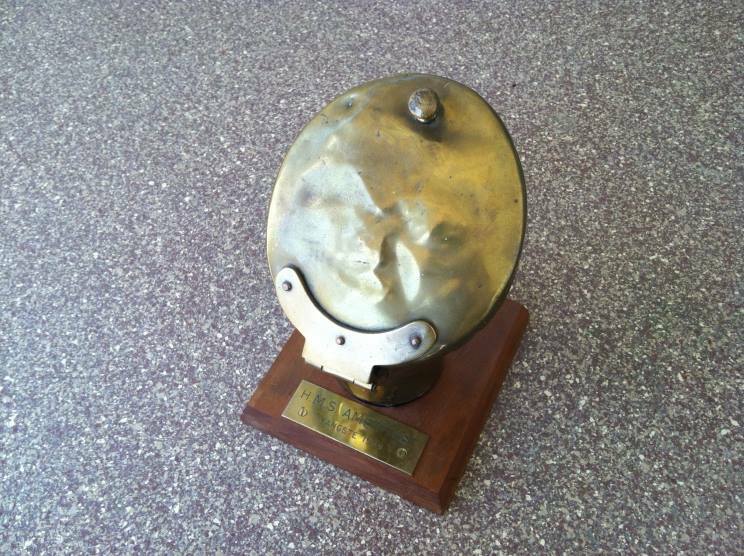 However, my uncle - who was in charge of Willabys at the time - did manage to save the wardroom bell and several photographs. My father-in-law, William J. Shears was also involved with the "incident". He was at the time a CPO Shipwright. At one time he was the youngest CPO in the RN at just 18. He had just completed two years in the Far East and had returned to his home in Brixham. He had, literally, just got through the front door after a journey home that took nearly five weeks when the local bobby turned up and told him he had to report to Plymouth immediately. Bill thought he was having a laugh until he saw the signal flimsy. A car took him to Plymouth where he was told Amethyst was stranded in the Yangtze and he was to go out to her at once. Querying why there wasn't someone else nearer at say Singapore or Hong Kong he was bluntly told to obey orders not question them! Amazingly, he was sent back to Hong Kong in under 40 hours! By that time Amethyst had broken out and he was sent on board to help effect temporary damage repairs en route to Singapore. The Cdr. Shipwright of the RN Dockyard was another Brixham man who told him that he needed a good Chief and would have him transferred. Bill protested that he'd just done two years and was snatched back before he'd even been home 10 minutes! To no avail. He did two more years away. Needless to say, his wife was not best pleased. I don't think that would happen in today's Navy. What a great pity Amethyst ended up as scrap in Sutton Harbour. I have read your message on MaritimeQuest with interest. I was onboard HMS Amethyst whilst she was trapped in the Yangtze, so I was not aware of all the activity going on whilst we were trapped in the River. The fact that your father in law, William Shears was flown back to China so quickly after he returned to UK suggest he had just been serving in AMETHYST and was sent back because he would be fully briefed on all her fittings etc. If so he was probably on board the ship in 1948, when I joined her, and served with me. I am afraid I can no longer remember all those onboard in those days. I imagine he would have remained in HMS TAMAR whilst AMETHYST remained in the Yangtze, and re-joined her after she escaped. If so he would have served with me in Hong Kong and on AMETHYST's passage back to UK. The reunion will be held on Friday 22nd - Sunday 24th September 2017, Toorak Hotel Torquay. Single room Dinner bed and breakfast for the weekend £140 & Double room Dinner bed and breakfast for the weekend £220. Gala meal Saturday Included in the weekend price. Those wishing to attend meal only £25 each. Rooms need to be reserved so please send a deposit of £25 each person to Trudy made out to Amethyst Association. These rates apply for the weekend only and at present no Saturday only rooms are available but may be free nearer the date. Membership Membership £7.00, widows £4.00 due in January. I am trying to get information on my father in law who was on the HMS Amethyst in 1949, Mr. James Nolan. His son Greg (my husband) would like to get more details on his father. We have seen him in two pictures on the MaritimeQuest site, but are wondering are there any other pictures of him available and more information on him? Sadly James passed away in 1994 and the family does not know much of his past. I would really appreciate it if you or Mr. K. Stewart Hett could help out in any way. P. S. Could I become a member of the HMS Amethyst Association. James Nolan was certainly in HMS AMETHYST whilst we were trapped in the Yangtze and when we made our escape. I only have one other group photograph showing your Father. It is the same as the picture on MaritimeQuest where he is sitting in the front on the left, except everyone has taken their caps off, though your Father has his cap off in both pictures! I presume you can download the pictures on MaritimeQuest. I could email you the other picture if you would like it. I do have several other pictures of activity on the ship, but I have not identified the people so I cannot say if he is in any of these pictures. If you are ever in the London area you are very welcome to come and look through my scrapbooks. I will put you Father's name on the notice board at our next reunion. My experience is, that after close on 70 years, people do not remember individuals unless they were particular friends with them. You are very welcome to join the AMETHYST Association. Our Secretary is Trudy Sampson, 1 Warton Lane, Austrey, Atherstone, Worcs. CV9 3EJ. If you get in touch with her she will fill you in with details. Our next Reunion is 16 to 18 September in Nottingham. We would be very pleased to see you there. The Reunion involves a buffet supper on Friday, on Saturday the AGM and a visit, I think we are going to the National Memorial Arboretum where we have established the “Yangtze Grove”. On Saturday we have a Dinner then on Sunday a short Church Service to Remember the men who lost their lives in 1949. Then we disperse. My Grandfather, Leslie John Webber, originally from Bampton, Devon, served on HMS Amethyst. I was just wondering if anyone remembers him. Photos showing below. I believe he worked in the engine room and would have been around 18 years old. He talks a little about his time on the Amethyst or the “Fighting A” as he calls her and often wonders what happened to his ship mates. Any information would be wonderful. According to my records Leslie Webber joined HMS AMETHYST in November 1949 and served in her during the Korean War. I will pass your details to one of our Members who worked in the Engine Room during the Korean War. As the Granddaughter of an AMETHYST man, we would welcome you as a Member of the AMETHYST Association. If you would like to join and receive our newsletter, please let me know and I will put you in touch with our Secretary. My father, Albert Williams, served in HMS Amethyst during the Yangtze Incident. Albert had two sons, my older brother Albert born in 1954 who carried his name, and myself Paul born two years later in 1956. As you will learn my father lost his life in a tragic accident after leaving the RN. Firstly, you need to remove the information in Message #101 dated 3 October 2012 from Phil Jelbert that my dad died working on a Newlyn Fishing Boat in Iceland that is incorrect. My mother, who never remarried, is still alive and although now in failing health has helped to compile the following informative data which I'm sure you will find interesting and helpful. My dad left the RN believed in 1957 when I was just two months old. In that year, as a family, my dad, mum, two year old older brother Albert and I lived at St. Buryan in a tied cottage my father working for a local farmer. We returned shortly thereafter to Pendeen where my father was born to be close to his relatives and friends. We lived at 31 Moorland Close, Pendeen. At the time my dad was the Captain of Pendeen AFC. He was an all-round sportsman also playing cricket and darts. My dad worked as a blaster at Geevor Tin Mine in Pendeen where his father had worked along with his brothers. My dad left Geevor Tin Mine and worked for a spell at Newlyn Quarry before returning to sea and it was there that he met his fate whilst working on the Coaster 'Yewhill' whilst docked in Cork, Southern Ireland. He befell a tragic fatal accident on the quay on 28 January 1959 aged 29. My dad's last letter to my mum sent from the Yewhill dated 14 January 1959, two weeks before his death, wrote he longed to be with us sending all his love. 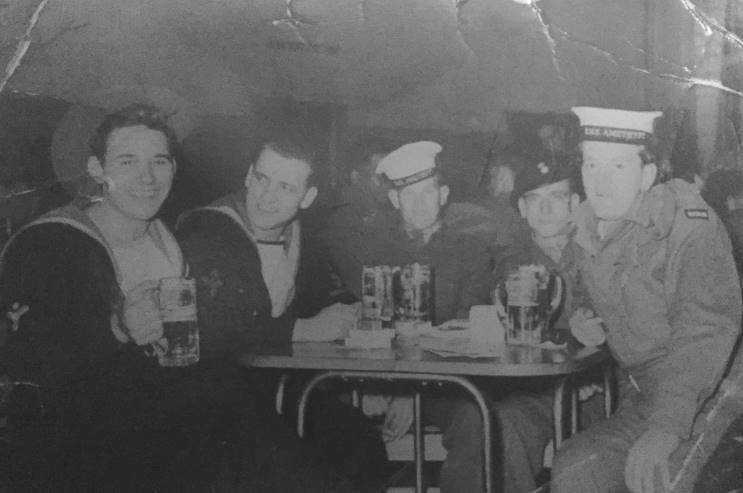 I would greatly appreciate any information you have of my dad whilst he served on the Amethyst, his friends, any stories, and photos you may have. My mum told me that he was known as 'Bertie' on board? My mum told me that my dad was badly affected by the death of his comrade killed beside him whilst fighting in the conflict suffering nightmares as a consequence. He did see the premiere of the film the 'Yangtze Incident' so much recovered by then. I hope my information is helpful towards a fantastic historical record that you have put together. 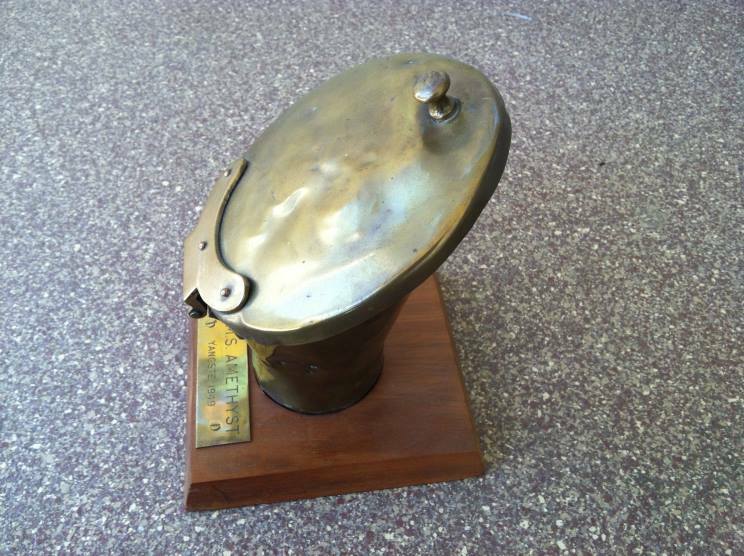 Myself and Raymond McCullough are currently negotiating a Yangtze Incident display and possible Memorial. The said display and memorial, hopefully, will be based on board HMS Caroline, now a floating maritime museum in Belfast. My late father and Raymond's late father both served on board HMS Amethyst during the Yangtze Incident in 1949. I sort of stumbled across your site today and thought I would add a comment. Towards the last messages is a note from Tony Walsh ref him buying then selling the bridge voice pipe from Amethyst when he was just in the navy in the mid 1950's. I am the buyer of same and still have it along with a medals trio from a AB that served on her in 1949 and also was aboard for her Korean tour. Tony had loaned the pipe to the Four Ships Assn for one of their re-unions and I have the paperwork from that he sent along with the pipe. It is in good hands even if it is in the US and has pride of place in my small RN collection I would like to add a 1949 NGS Yangtze to from anyone on Consort also so if there is one for sale out there please advise me. I can supply a photo of the Voice Pipe if anyone would like to have that. It is with sadness that we share with you the passing of my grandfather - Bill "Taf" James - on the 2nd of April, 2016. I'm not precisely sure when gramps served on the Amethyst, only that it was sometime during WWII. I've noted a post on this message board from a Mr Charlie Chivers who references a Taf James possibly being in 6 Mess in 1946, if that provides a clue. Gramps was immensely proud of his time on the Amethyst, and the room in which he passed was adorned with pictures and clippings from those days, along with some from Amethyst reunions. Bill was loved by all who knew him, so we thought you may like to know. Funeral services are at 1100 on Friday 15 April at Margam Crematorium, Longland Lane, Port Talbot, SA13 2NR. Taff was a strong supporter of the HMS Amethyst Association and his wonderful voice will always be remembered, particularly leading the singing at our Reunion Church Services. It is with great sadness that we announce the death of Ray Kitto. Ray died at home on Tuesday 15 March 2016. Ray served on the AMETHYST Association Committee, and as the Association Welfare Officer he did a wonderful job keeping in touch with our Members. Ray was not a naval man, but served in the RAF and with the Metropolitan Police nonetheless he was a great admirer of the Royal Navy and of Members of the AMETHYST Ships Company. He will be greatly missed by us all in the Association. His funeral is at 1100 on Monday 4 April at St Hilda's Church, Stanwell Rd, Ashford Middlesex, TW15 3QL. With sadness we announce the death of Mrs. Gwen Winfield, widow of Ken, on 11 October 2015. Gwen and her family were staunch supporters of the AMETHYST Association. Ken Winfield was one of a small band of engineers who maintained AMETHYST's engines whilst the ship was trapped in the Yangtze River and ensured they ran at maximum speed during her night escape from the River. Gwen Winfield's funeral will be held at: Milton Chapel, Chiltern Crematorium, Amersham, Bucks. HP7 0ND. at 2:30pm on Monday 26 October, then after at Chesham Town Hall, Chesham Bucks, HP5 1DS. The Amethyst reunion will be held on the 18th to 20th September 2015 at the Mercure Swindon Hotel South Marston, South Marston, Swindon SN3 4SH. We have a carvery meal arranged for the Friday and our Gala meal on the Saturday. Dinner, bed and breakfast for a double works out at £244 and single at £191 (Sat nav SN3 4SH). All welcome! Rooms can be booked now, phone 01793 833700 and say you are with the Amethyst Association. Looking forward to seeing some of you there. My father, Vincent Steers Chatfield, served on HMS Amethyst in 1945 and 1946 as an Able Seaman. I believe he was injured in an onboard accident while taking on supplies in Auckland, NZ, however he rejoined the ship and sailed to Sydney, Australia where he was put ashore to recover from his injuries. He was awarded the King's Badge as a result of the above mentioned incident. Do you have any information about his time aboard the Amethyst.